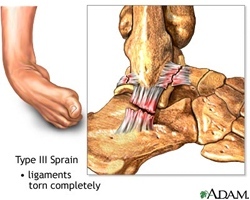 An ankle sprain is an injury to one or more ligaments in the ankle, most commonly on the outside of the ankle. Ligaments are bands of tissue – like rubber bands – that connect one bone to another and bind the joints together. In the ankle joint, ligaments provide stability by limiting side-to-side movement. Ankles sprains often result from a fall, a sudden twist, or a blow that forces the ankle joint out of its normal position. This may occur while participating in sports, wearing inappropriate shoes and walking or running on uneven surfaces. They may also occur as a result of the patient having weak ankles from previous foot/ankle injuries and also from genetics. A more severe ankle injury may have occurred along with the sprain. This might include a bone fracture that, if left untreated, could lead to troubling complications. After surgery, rehabilitation is extremely important. Completing your rehabilitation program is crucial to a successful outcome. Be sure to continue to see your foot and ankle surgeon during this period to ensure that your ankle heals properly.